The Tsogo Sun Sports Academy nurtures school environments that promote healthy living and responsible attitudes to foster the development of successful young South Africans. This vision is shared by the Department of Education and the Department of Sport. 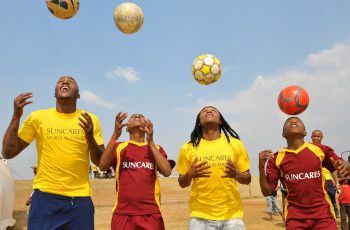 The Tsogo Sun Sports Academy uses sports as a medium to deliver life skills, leadership and healthcare training as well as to reinforce the importance of education to young learners, with the ultimate goal of nurturing children’s wellbeing. 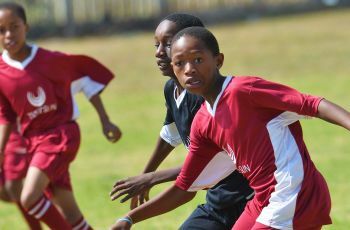 Our Sports Academy currently supports the development of more than 22,000 South African children and youths between the ages of 7 and 17 in soccer, rugby, athletics and chess (Tsogo Sun Moves for Life programme) which translates into over 600 teachers across more than 120 schools across South Africa. Soccer, rugby and athletics training and accreditation is provided to educators, trainers, coaches, tutors, mentors and referees in these programmes. To achieve this, Tsogo Sun has partnered with relevant local government departments, schools, sporting industry and school sports bodies in communities. The Tsogo Sun Moves for Life programme provides a structure for the implementation of chess as an educational intervention at school, actively connecting aspects of the game with maths, science and life skills concepts. Learning is made fun and exciting for young school-goers. Participation in the programme continues to grow and currently reaches 21,300 learners and 535 educators across 57 schools in South Africa. 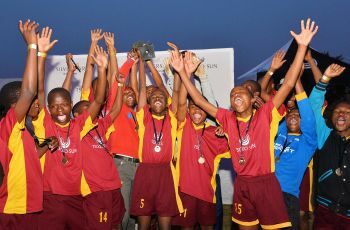 A year of exciting development with soccer and life skills training for over 600 school boys culminated in a tournament at Lusaka Sports Complex in Swaneville on the West Rand on 29 October, to celebrate the year and give the players the opportunity to pit their burgeoning soccer skills against each other. 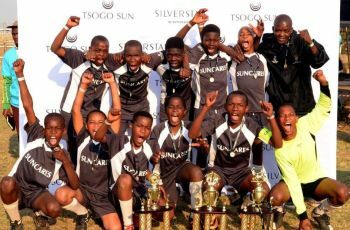 The Tsogo Sun Soccer Academy’s 2016 Season Closing Tournament featured three divisions – U12, U14, and U16 – with the top teams from the Academy playing round-robin games to determine the overall winning teams. At the end of the one-day tournament, all teams received a certificate and medal for participating, and trophies were presented to winning teams, selected top players and coaches from the season. 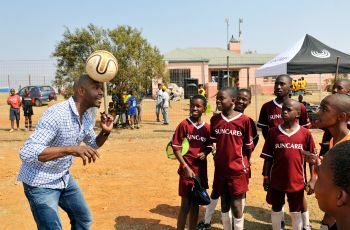 Showing their support at the tournament were ambassadors of the programme, former Bafana Bafana captain, Lucas Radebe, and former SuperSport United and current Kaizer Chiefs player, Morgan Gould. 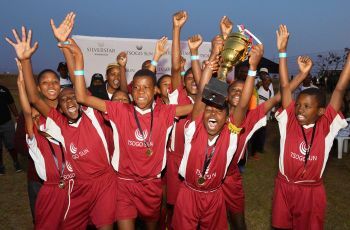 The Tsogo Sun Soccer Academy, which is sponsored by Silverstar Casino, has 629 learners in 64 teams from 35 Mogale City schools – 25 primary and 10 high schools – who participated in the School League during the year. 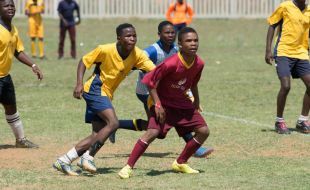 In addition, the Tsogo Sun Soccer Academy also includes a talent development programme consisting of four teams – U14 / U15 / U17 / U19 – that are made up of players from across all the schools in the programme and that have joined the highly competitive Soweto Football Association League. They are a selection of the strongest players who show the greatest potential in the game combined with strong off the field discipline and commitment. 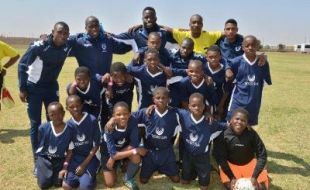 The Academy has been operating in various communities on the West Rand since 2010, providing weekly training and interschool league matches, talent identification and development, as well as life skills development to encourage youngsters to reach their full potential. The Academy has five full-time coaches, five volunteer assistant coaches, and 64 school coaches, and provides a platform for coaches to develop their coaching skills through various programme-related courses. Recently, two of the coaches, Gift Mokguo and Sammy Magalefa, successfully completed a Sports Management diploma through Boston Business College. 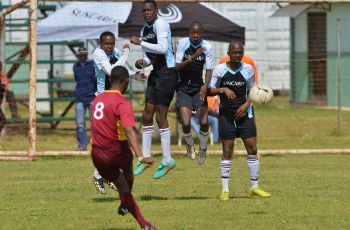 The tournament has also become a good hunting ground for soccer scouts and several talented young players have been scouted by clubs such as Kaizer Chiefs, Bidvest Wits, Supersport United and Orlando Pirates over the years – and are doing well. Paine says that the Tsogo Sun Soccer Academy programme is strongly supported by the local district of the Gauteng Department of Education. “We have a strong collaboration with local school district officials, schools and their educators, as well as the parents of the young players, and how we all work together to equip their children to make better choices throughout their lives,” she adds. Tsogo Sun is the leading hotels, gaming and entertainment company in South Africa, providing a variety of hospitality and exciting entertainment and leisure experiences. Combining an established heritage with a professional and energised approach, the group proudly encompasses 14 casinos and over 90 hotels in South Africa, Africa, the Seychelles and Abu Dhabi. The company’s hospitality interests offer a wide distribution of hotels in Africa, providing world-class accommodation across all markets, including elegant, individually branded luxury hotels and well-known trusted market leaders in the premier through budget segments, including Southern Sun Hotels, Garden Court, SunSquare, StayEasy and SUN1 hotels. The exciting urban and resort casino portfolio includes the most popular entertainment destinations, strategically located throughout South Africa. In the Gauteng province, Tsogo Sun owns the group’s flagship property, Montecasino in Fourways, which features, amongst other attractions, the award-winning Teatro; Gold Reef City Casino and Theme Park in Southern Johannesburg; and Silverstar Casino to the West in Krugersdorp. Additional properties are owned and operated in the Western Cape, Eastern Cape, Free State, Mpumalanga and KwaZulu-Natal, including the jewel on Durban’s Golden Mile, Suncoast Casino, Hotels and Entertainment. Tsogo Sun Citizenship is the group’s corporate citizenship strategy which encompasses three areas of focus. This includes Corporate Social Investment, whereby the group promotes the development of learners through three academies which offer holistic, full-year programmes centred around sport, art and education; Entrepreneur Development which focuses on skills-based entrepreneurial development through its Tsogo Sun Entrepreneurs and Supplier Development programmes; and Environmental Education, committed to initiatives that reduce the impact the business has on the environment. Tsogo Sun (“TSH”) is listed on the Johannesburg Stock Exchange. The key shareholders of Tsogo Sun are Hosken Consolidated Investments Limited (“HCI”), a JSE listed investment holding company. Tsogo Sun Gaming supports the National Responsible Gambling Programme. Winners know when to stop. Only persons over the age of 18 are permitted to gamble. National Problem Gambling counselling toll-free helpline: 0800 006 008. For more information, go to tsogosun.com, follow us on Twitter and Instagram @TsogoSun or like us on Facebook. 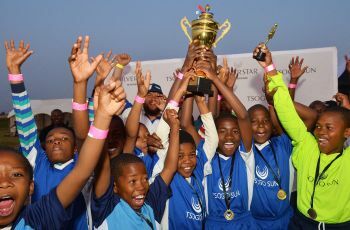 It has been another year of success and personal growth for the young players of the Tsogo Sun Soccer Academy, as the season closed with an exciting tournament on Saturday 19 September at Lusaka Sports Complex in Swaneville on the West Rand. To be a part of the programme, the youngsters also have to maintain a good academic record, and homework in the specially-installed containers at Swaneville will take precedence over soccer practice if necessary. “Our Academy is very different from other academies in Gauteng. Our emphasis on life skills, values, and academic success is not common, and is very appreciated by the parents of our players, as well as by the players who can see that they are being equipped to make better choices throughout their lives,” says Mokguo. Shanda Paine, Tsogo Sun’s hands-on Group CSI Manager explains that the Tsogo Sun Soccer Academy, now closing its sixth year, was established to provide disadvantaged youngsters with opportunities to become educated, capable and skilled adults through a holistic approach that incorporates lifeskills development within their sporting programmes. At the same time sporting talent and tertiary education opportunities are identified and developed. 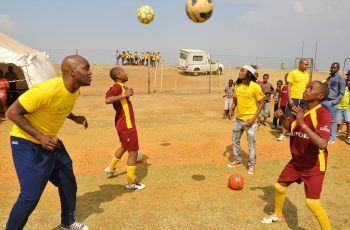 The programme operates in 35 schools in Kagiso on the West Rand, working with 40 teachers and more than 1 000 learners, providing closing tournaments, inter-school leagues that run weekly for six months, ‘coaching the coaches’ programmes, lifeskills, and a development academy for talented players. The most talented players of each age group are also provided with an opportunity to participate in a SAFA-affiliated league – the Soweto FA League – each year. This year the Academy added a school holiday programme to its activities, which ran in July and included various lifeskills workshops for 80 players between 13 and 19 years. Soccer practice was woven in between the sessions to keep them fit and healthy. “Included were valuable skills such as a two-day certified first aid training course for the older players, lessons on financial literacy, an informative workshop on substance abuse by Westview Clinic, as well as ‘U-Shine’ sessions that focused on empowerment and self-confidence for these young learners,” says Shane Collinson, Director of Operations and Complex General Manager at Silverstar Casino, which is responsible for the successful running of the Tsogo Sun Soccer Academy. After the closing tournament, Tsogo Sun Soccer Academy takes the U20 team away in recognition of their hard work, their achievements, and as a farewell gesture. This year the team will be visiting Durban where they will participate in a Metro tournament as well as having many exciting new experiences such as staying in a hotel, seeing the sea, and much more. 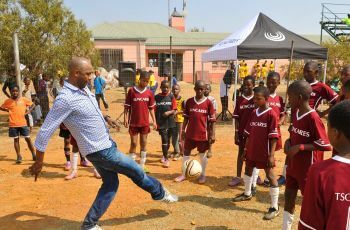 “Our soccer programme is touching lives in a sustainable way, but what has contributed to its success are our partnerships with the schools, the SA Football Association, and the communities. The Academy has grown steadily over the years and we’re proud of what so many of our young soccer players are achieving in life through it,” says Paine. ISSUED ON BEHALF OF TSOGO SUN BY STRATEGIC PUBLIC RELATIONS. FOR FURTHER INFORMATION PLEASE CONTACT GAOLE BOGATSU ON (011) 672-2037 OR gaole@stratpr.co.za. Already a proven winner as a soccer coach for under-12 and under-14 boys, Tsogo Sun Soccer Academy Coach Londiwe Hlatswayo has taken her winning streak up a notch and won the gsport Volunteer of the Year Award. gsport was launched in 2006 to raise the profile of South African women in sport, and to encourage corporate South Africa to back its female athletes. The annual awards ceremony was held on 14 August and women were celebrated for their contribution to sport across a range of categories. Hlatswayo joined the traditionally male-dominated ranks of soccer coaching by default. She had always been a netball coach, but when she moved to Khaselihle Primary School in Kagiso on the West Rand in 2012, there was no place for another netball coach. She coached athletics until the season ended and then turned to soccer with the Tsogo Sun Soccer Academy. To ensure sustainability of the Soccer Academy, coaches are sourced from among the teachers in the participating schools and are then given the opportunity to become qualified coaches through a programmes partnership with the South African Football Association (SAFA). Hlatswayo attended training and quickly acquired a knowledge of the sport, achieving her qualification as a level one SAFA accredited coach. With a constantly growing strategic understanding of the game, her under-12 and under-14 teams fast became winners in their events and tournaments. The learning curve was steep but Hlatswayo’s passion for sports and her tenacity and commitment to creating an environment that fosters community support and respect for the students, the game and the coaches, quickly took her to the top of her game. 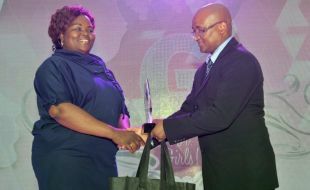 “We’re immensely proud of Londiwe, but not surprised that she has achieved this prestigious award from gsport. She is a winner, not only because of her firm grasp of the game and her ability to inspire and motivate our young soccer players, but also because of her commitment as an educator and to soccer as a unifying force in a community is inspiring,” says Shane Collinson, General Manager of Silverstar Casino. 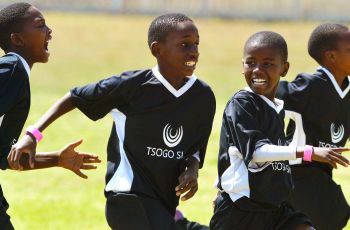 The Tsogo Sun Soccer Academy is designed to promote healthy living for youngsters, as well as a life-long participation in sport, in line with government’s vision. In the programme, soccer is used as a medium to deliver lifeskills, leadership, and healthcare training, while also reinforcing the importance of education to young learners. The Academy operates in 35 schools in Kagiso on the West Rand, working with 20 teachers and more than 1000 learners. 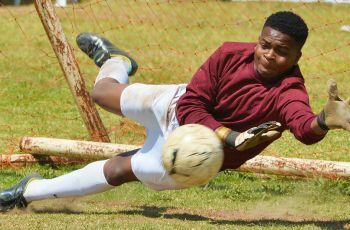 Hlatswayo shares the Tsogo Sun Soccer Academy belief that sport is a tool for transformation that can enhance a learner’s life and encourage a positive mindset with the potential to produce a well-rounded individual. There’s a wealth of ways for our sporting heroes in South Africa to get involved in the development of sport – especially at grassroots level in disadvantaged communities around the country. Being a truly good role model for youngsters, both on and off the field, is a win-win situation for both the sports heroes and the youngsters they interact with. The youngsters are inspired and motivated to do their best to rise to the heights that their sporting heroes have achieved; and the sportsmen or women have the chance to be involved in sports development in South Africa – an enviable position for all sporting greats. This is about much more than just giving back. It’s an acknowledgement of the responsibility that we all have as South Africans to support others in the interests of building a better country – and it’s a recognition of the support and encouragement they as sportsmen and women have received over the years, which had a powerful impact on their lives and careers. The fact is, development is a key part of life in this country – and sports development is being recognised as crucial, not only to the ultimate improvement of our top sports teams, but also in offering a more holistic and positive lifestyle to youngsters who live in disadvantaged circumstances. In our Sports Academy, which is Tsogo Sun’s corporate social investment (CSI), our sports programmes are multifaceted in that they’re not only about playing well; they’re also about teaching life skills that will benefit the youngsters throughout their lives, allowing them to see life through different lenses, to make smart choices, and to believe and hope, knowing that they have people who believe in their potential. Sports people, whether retired or still active, can be examples of the best way to live your life in the face of fame and fortune; of the need for determination and hard work in order to be a winner; of the importance of always showing respect for everyone you encounter as you progress in life; and of the immeasurable value of being a giver in life, and not just a taker. We’ve seen many fallen sporting heroes in the world in recent years, but their examples just emphasise the importance of being a positive role model – a person with strong positive values who is an achiever; who is willing to get involved in developing sport for the benefit of the country. At our recent rugby festival held in Diepsloot where 612 youngsters participated, several of our SA Rugby Legends attended and expressed interest in doing more. 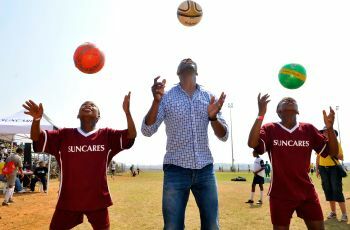 At every soccer tournament, the likes of Lucas Radebe, Doc Khumalo, and several past and current soccer greats come and spend time with the youngsters and are an inspiration by engaging with them. If this ‘giving’ can be harnessed and targeted at grassroots sports development level, it could have a massive impact on our nation’s sporting profile. And let’s face it, we are passionate about sports in South Africa – it’s one of the most unifying aspects of life in this country. There are many anecdotes to back up this approach, but one of my favourites is that of Ashwin Willemse, who as a teenager was a young maverick in the town of Caledon. He was in high school and involved in drugs and gangs, just passing time at school. One of our Springboks – I think it was Breyton Paulse – visited the school and saw potential in this youngster who was considered by many to be a lost cause. After the visit, he sent a full rugby kit to Ashwin. It changed his life. Someone believed in him and he was inspired and motivated to become one of our top Springbok players, scoring tries that were just about impossible, boosting the reputation of our national team – and most importantly, inspiring other youngsters to rise above their disadvantaged circumstances and live up to their potential. What a wonderful legacy to leave behind. Ashwin is now too giving back to the game and paying it forward. Being involved in the development of sport at grassroots level and inspiring youngsters to do their best and become positive role models themselves is a privilege open to our sporting heroes. Let’s hope that they embrace it and find ways to touch the future of sport in this country.